My other pair of lonely shorts finally has a friend. 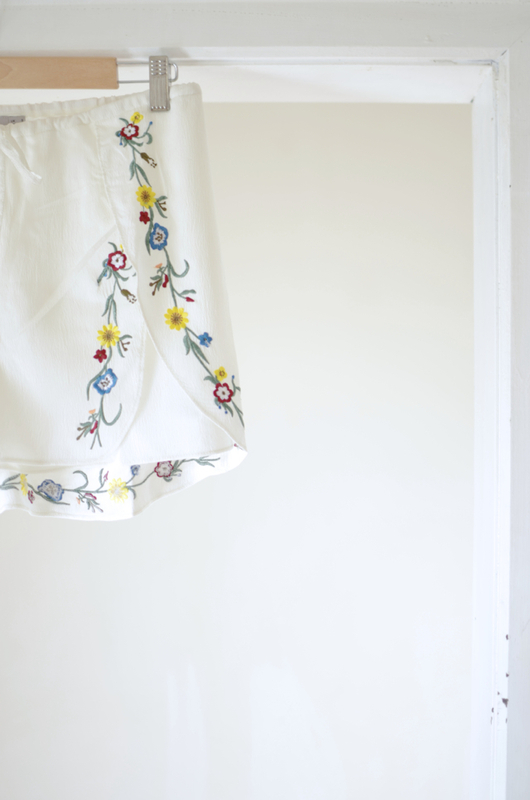 It comes in the shape of a billowing white number with flowery embroidery around the edges. I would never had intentionally searched for an item with the above description. I was actually searching for shorts and was refining the colour options - since I have a thing for white (more on this soon!) it was the obvious colour to narrow down first. My openness to trying colour and print seems only applicable when it comes to bottoms and there was no exception with this lovely pair. I think the embroidery being only around the edge while every other design aspect is kept to the bare minimum makes this weirdly fit in with my aesthetic. I can see this pair of shorts work effortlessly with a white tee during summer days and also dressed up with a silky camisole and a pair of wedges or minimal heels. My favourite way of wearing the pair will probably be during evening walks down by the beach as the ocean breeze will truly make the shorts anything but ordinary due to the cut and light weight material. Anyway, that is still a few months away since Winter is still here to stay. Now back to jeans, sweaters and coats after playing dress up with these shorts!